SERDANG, 6 May 2014 – The government has been able to save some RM2 billion since the research university programme began in 2007 enabling post graduate students to do their doctorates (PhD) in local institutions. 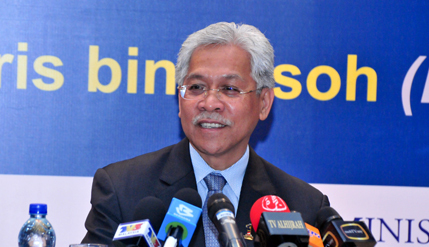 Education Minister II Datuk Seri Idris Jusoh said the five local research universities (RU) had undertaken the PhD programmes at a cost of RM500,000 per candidate, compared to RM1million to send them to universities overseas. Speaking after officiating a two-day Media Event Showcasing Research Universities’ Success Stories at Universiti Putera Malaysia (UPM) here today, Idris said some 4,000 post-graduate students had completed their PhDs at a total cost of RM2 billion – half the cost of doing their doctorates in foreign universities. He said other public universities which have not received grants for certain types of research were cooperating with the RUs. That had brought about an “explosion” of academic and research work, with 2,200 new professors being produced. In economic terms, the research universities generated revenues of RM10.8 billion and the creation of 108,000 job opportunities. The event showcasing the success of research universities was the second in a series of five, this time focusing on the task of Talent Management which had been entrusted to UPM. It displayed the five aspects of Talent Management; namely Sustainability, Entrepreneurship, the Environment, Food Security and Health. For the Media Event RU’s Success Stories each of the RUs were given the responsibility of promoting science and innovation to help the country achieve the status of developed nation by the year 2020. The National University of Malaysia (UKM) was given the responsibility of showcasing their economic and social impact. Four universities including UKM had been awarded the status of research University in 2007 under the 9th Malaysia Plan with Universiti Teknologi Malaysia (UTM) gaining the position in 2010 under the 10th Malaysia Plan. The five institutions had been steadily increasing their focus on post-graduate studies, especially at PhD level in order to act as a catalyst to research and development.